Monique Lexy, her husband and their six children saw their lives turn upside-down when their house was completely destroyed in the January 12, 2010, earthquake that hit Haiti. The family set themselves up in a makeshift shelter made of plywood and timber, but lacked the technical skills needed to rebuild their house in a safe manner. Two years after the earthquake, Monique and her husband participated in a homeowner-driven housing reconstruction program implemented by Cordaid, with technical assistance and training provided by Build Change. They first participated in a safe construction awareness seminar that helped them understand why so many houses collapsed during the earthquake They also learned the key elements needed to make a house earthquake-resistant. They then sat down with a Build Change engineer to plan the layout of their new house. 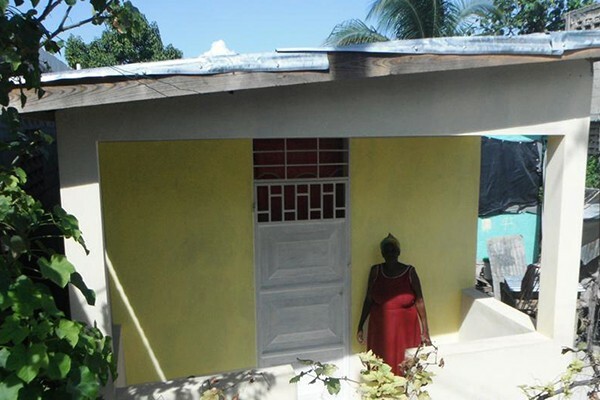 With $900 and a subsidy from Cordaid, the Lexy family was able to construct a two-room house which can be expanded in the future. The total cost of the house was $4,300. Monique is proud to have chosen personal touches for her house. Monique and her husband both supervised their house’s construction, with technical assistance provided by Build Change. Monique is proud to have chosen personal touches for her house, and is extremely thankful for Build Change’s assistance, as without it, neither herself, her husband nor the builders in their community would have had the knowledge or skills to rebuild in an earthquake-resistant manner. Now, they are confident that when the day comes for them to expand their house, they will remember the essential advice given to them by Build Change engineers to build a safe expansion on their own.